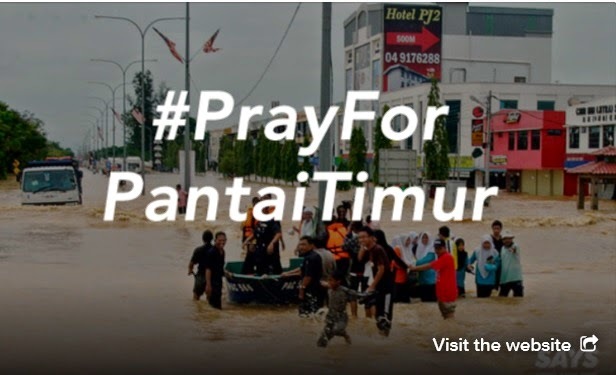 To date, more than 160,000 Malaysians were evacuated due to the flooding situation in Pahang, Kelantan, Terengganu, Johor, Perak and more. According to The Star, the east coast states have it worst, with Kelantan alone accounting for 81,925 evacuees. The flood situation in Pahang is also critical, with at least 8 major rivers breaching the danger level. The number of evacuees in Pahang is at 35,564. Terengganu has 35,246, Perak has 6,730, Johor has 1,096, Perlis has 195, Selangor has 85 and Negeri Sembilan has 80 evacuees. Access to some of the east coast states is almost totally cut off, because most of the main roads in the affected areas are submerged in water. At the moment, there is no sign that the situation will improve. The Meteorological Department has also issued a statement to warn people of the possibility of monsoon rains occurring from today till Wednesday. States affected by the alert are Perlis, Kedah, north Perak, Kelantan, Terengganu, Pahang, Johor, Sabah (Kudat and Sandakan) and Sarawak (Kuching, Samarahan, Sri Aman, Sarikei, Sibu, Mukah and Betong). At this point of time, at least 8 people have been killed due to the floods. This is the season to share, care and contributes! Hope each of us will do our part to ease their trouble.